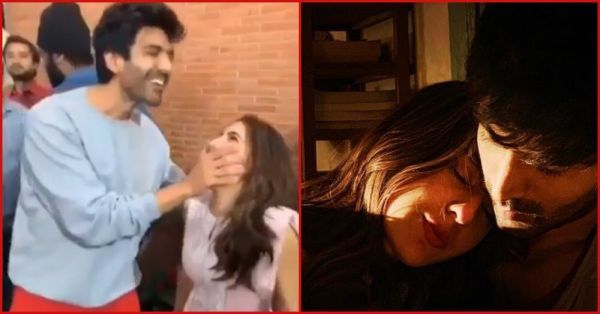 Bollywood's newcomers Kartik Aaryan and Sara Ali Khan started making the headlines even before they formally met each other. Their respective Koffee With Karan episodes were, in fact, confessions about how much they admire each other. Since then, their fans have been incessantly shipping the duo, and it seems like the universe has conspired to bring them together (or may be it was filmmaker Imtiaz Ali). The actors have already begun working on an Imtiaz Ali film, which is the sequel to Love Aaj Kal. A few of their leaked videos and pictures from the sets of the movie broke the internet this month and more is coming our way. There's no denying that they look adorable together. According to reports, Sara and Kartik are currently in New Delhi to shoot for Imtiaz's film. A video from what appears to be the shoot location is doing rounds on social media and captures the two actors laughing on a private joke together. At one point, an apparently high-on-sugar Sara shouts Kartik's name at the top of her voice while an embarrassed Kartik tries to cover her mouth. We hear the shouts from the fans outside who get excited after listening to Kartik's name. 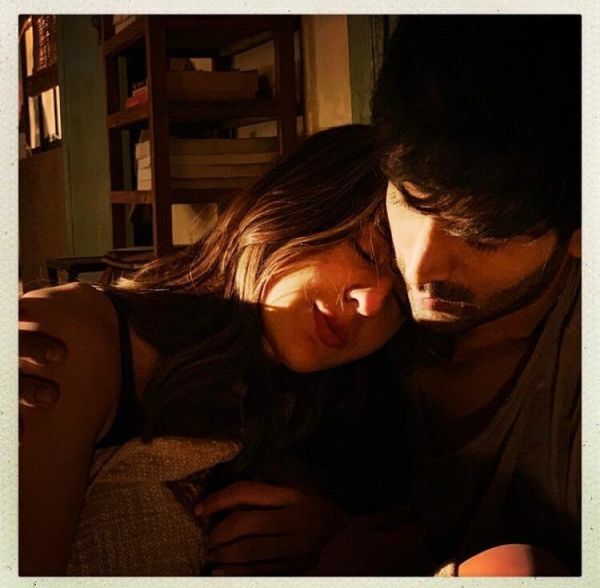 Kartik and Sara took to Instagram a few days ago to share the first look from their upcoming film. The film will hit the screens on Valentine's Day 2020, and also stars Randeep Hooda. Sara posted, "Honoured, grateful and uncontrollably excited to be a part of Imtiaz Ali ‘s next! 🙏👀😍🤩😀🤞🏻Starring @kartikaaryan (😱🔥) & @randeephooda." Recently, Sara posted her pictures on Instagram after winning the Filmfare award for Best Debut (Female). 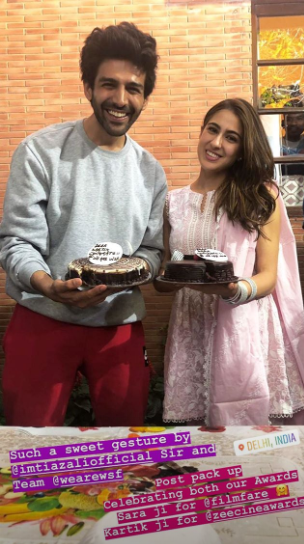 While Sara thanked the entire team of Kedarnath as she shared her happiness with all her fans, Kartik's comment on her pictures caught everyone's eye. Kartik congratulated Sara for her great achievement and also asked her out. He wrote, "Congratulations Sara ❤ Ab toh coffee se kaam nahin chalega, Dilli mein party karte hain!" It seems like the Luka Chuppi actor wants more than just coffee dates with Sara. Kartik also posted an Instagram story in which the two actors are celebrating their win after the Filmfare awards. Another power couple on the way? Even Sara took to her Instagram to post their celebration video. 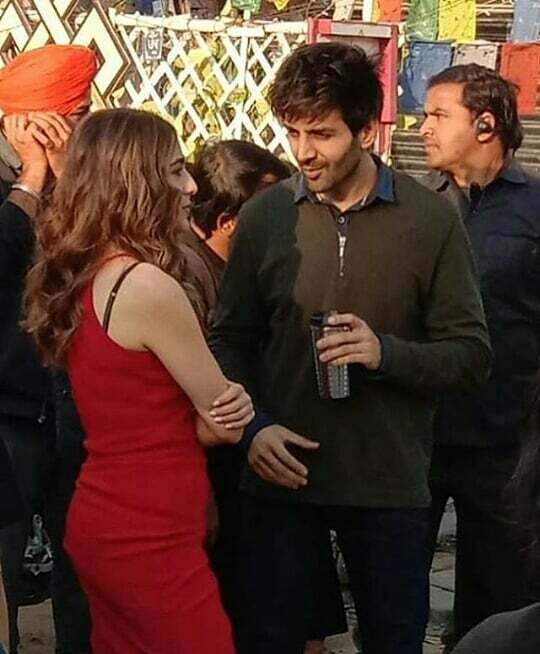 Sara and Kartik were also spotted shooting for the film in Delhi over the last couple of weeks. Pictures of them riding a bike, and a video of the two actors slow dancing and kissing went viral on the internet.